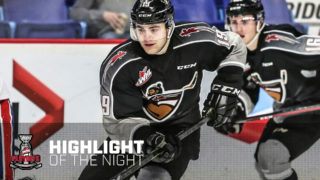 Tonight the Vancouver Giants wrap up the November portion of their schedule when they head to the Okanagan for their third meeting of the season with the Kelowna Rockets. For the Giants this will be their second game of a four-game in six-night stretch. Last night the G-Men erased a 3-1 first period deficit en route to a 5-3 home victory over the Saskatoon Blades. Michael Dyck’s crew will now take a three-game winning streak into tonight’s matchup with the Kelowna Rockets who are 5-4-1-0 in their last 10 and are looking to avenge a Saturday loss in Everett. Tonight marks the first time that the Giants will face the Kelowna Rockets with head coach Adam Foote behind the bench. Foote took over as head coach on October 23rd. Since the change, the Rockets have gone 7-4-1-0 after starting the season 4-10-0-0. That turnaround has guided the Rockets back into the top eight in the Western Conference standings. 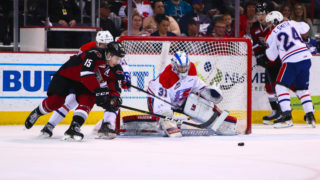 The Rockets currently hold a three point lead on Kamloops for the eighth and final playoff spot in the Western Conference, but have also played in four more games. Offensively the Giants are led by 1999-born forward Kyle Topping. The product of Salt Spring Island, B.C. leads the Rockets with 30 points in 26 games. He’s notched goals in each of his past two games and has proven to be a real power play threat. Seven of his 11 goals have come via the power play. In 151 career games with the Rockets, Topping has managed 47 goals and 77 assists for 124 points. He’s scored the lone goal of the season for the Rockets against Vancouver. 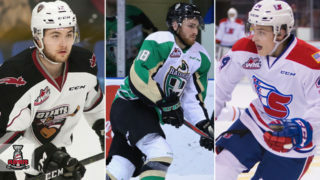 Come June, two more Kelowna Rockets defencemen are likely to hear their names called in the early rounds of the NHL Draft. Lassi Thomson (7G, 12A) and Kaeden Korczak (2G, 12A) are one-two respectively in team scoring among defencemen. Thomson, a 2000-born defencemen is a late birthday and was selected by the Rockets 53rd overall in the 2018 CHL Import Draft. Korczak was born in 2001 and was selected 11th overall in the 2016 WHL Bantam Draft. Last night at home, Davis Koch led the charge with two goals and an assist for the Giants. His eight goals and 18 assists give him 26 points on the season, and has him ranked tops among all Giants skaters in scoring. Over the course of his six-game point streak, Koch has registered five goals and eight assists for 13 points. In two games against the Kelowna Rockets, Koch has recorded a goal and two assists for three points. 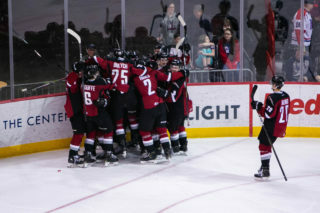 In two prior meetings this season against Kelowna the Vancouver Giants are 2-0 and have outscored the Rockets 8-1. The last time these teams met at Prospera Place the Giants earned a 5-0 win on October 3rd on the strength of a Trent Miner shutout. Then on October 21st the Giants defeated Kelowna 3-1 on the strength of two goals from Owen Hardy and 28 more saves from Trent Miner. Overall, Miner has stopped 59 of the 60 Kelowna shots he’s faced so far. Coming into tonight’s game the Vancouver Giants power play has converted on 10 of its past 32 chances. Additionally, the penalty kill has been equally as effective going 20 for its last 21. 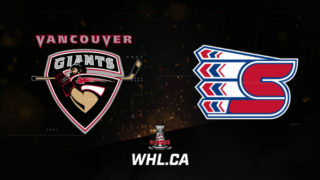 The Giants are 2/8 against Kelowna on the man advantage while the Rockets have gone 1/6 against the Giants.